The MTA is hosting two meetings in early May to discuss the L train shutdown between Manhattan and Brooklyn. UNION SQUARE — The MTA has set a date for the second of two meetings where it will give more information on a potential L train shutdown between Manhattan and Brooklyn. The meeting — which will solicit feedback from the community and include a question and answer period — is scheduled to take place on May 12 at 5:30 p.m. at the Salvation Army Theatre located at 120 West 14th St. The MTA is also hosting an L train shutdown meeting in Brooklyn on May 5 at 6 p.m. at the Marcy Avenue Armory located at 355 Marcy Ave. 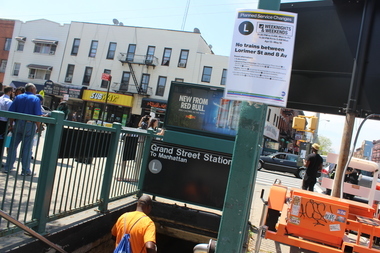 The MTA has said the shutdown is necessary in order to allow crews to repair damage done during Hurricane Sandy to the Canarsie Tunnel, which connects Manhattan and Brooklyn. The agency has estimated that a full shutdown would take around 18 months and a partial shutdown would take three years. They have yet to determine which course of action to take, officials said. These options and others on the table will be discussed at the two meetings in early May, according to the MTA. They're looking for community feedback and will have a question and answer period. Construction on the Canarsie Tube is not likely to begin until 2019, according to the MTA. The agency will repair other tunnels that were damaged during Sandy between now and 2019, they said. Those repairs will not require fully shutting down the other tunnels, the agency said. In preparation for work on the Canarsie Tube, the MTA is looking to fast track repairs to the M train line between Myrtle Avenue and Middle Village, they said. Repairs to the M train will shut down the line in the summer of 2017 and construction could take from six to eight months, but potentially longer, officials said. As part of the MTA M train repairs, the agency will have to move residents out of 26 apartments and two local businesses while it tears down and rebuilds a piece of the aboveground tracks near Myrtle Avenue and Broadway.